Health Concerns is dedicated to promoting the benefits of herbal therapies by providing the highest quality herbal products available today. They understand that the traditional means of administering Traditional Chinese Medicine, through the brewing and drinking of teas is not often effective for Western patients and have therefore developed a wide range of products based on TCM formulas in a tablet form. Health Concerns delivers outstanding products and services that improve people’s lives. They are dedicated to improving the quality of life while sustaining the quality of our earth. They encourage social responsibility. If you’re looking for a natural herbal supplement that may work to alleviate certain symptoms associated with minor stress‚ you might want to try Calm Spirit by Health Concerns. Notably‚ this product contains a modified ding xin wan formula. According to proponents of traditional Chinese medicine (TCM)‚ ingredients in this formula—such as amber resin (hu po)—may help address symptoms such as mild anxiety or trouble sleeping. Moreover‚ Calm Spirit could potentially work to maintain optimal cognitive function. This supplement could also play a role in relieving certain symptoms associated with deficient heart qi‚ like dry mouth and heart palpitations. 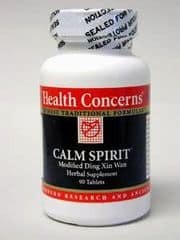 Finally‚ Calm Spirit contains an array of enzymes and nutrients that may help address other stress-related symptoms. Specifically‚ catalase may work to protect your cells from free radical damage‚ while magnesium may have a mild sedating effect.